It seemed to take me ages to read this book but it certainly wasn’t because I wasn’t enjoying it. I had one of those very busy weeks where I hardly had time to pick up a book, which was very frustrating as I really wanted to know what was going to happen! I read the first of this series last year and really enjoyed it but if anything, I enjoyed this one even more. Don’t worry if you didn’t read the first book, The Little Bookshop of Lonely Hearts, as this is a self-contained story with only passing references to the first book. What I particularly enjoyed about this book were the references to Pride & Prejudice scattered throughout. There are apt quotations from Jane Austen’s classic at the beginning of each chapter and it is Verity’s favourite book, almost her bible. When faced with any tricky decisions, her mantra is ‘What would Elizabeth Bennet do?’. The story itself certainly had parallels with Pride & Prejudice too with Verity having four sisters, being intelligent, strong-willed and independent and with the relationship between herself and Johnny being not dissimilar to that between Elizabeth and Mr Darcy. But does everything end up as it does in the original with a ‘happy ever after?’ (coincidentally the name of the bookshop where Verity works). Well, I’ll leave you to find that out when you read the book. True Love at the Lonely Hearts Bookshop is, as the title suggests, a sweet romantic story. It has a lot of warmth and humour and is perfect escapism when you want a feel-good read. I must add that I loved Verity’s large and eccentric family and would love to read more about her sisters at some point. True Love at the Lonely Hearts Bookshop is published by Harper Collins and available in paperback and e-book. It is available at all good bookshops or you can order a copy online here. Thanks Kate, really enjoyed it. Sometimes we just need something light that will put a smile on our faces. 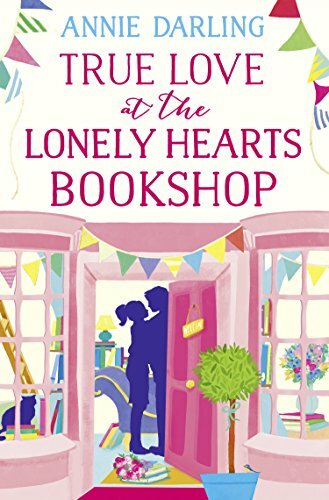 Check out the book, True Love at the Lonely Hearts Book Shop, by Annie Darling, as feature on the Portobello Book Blog.